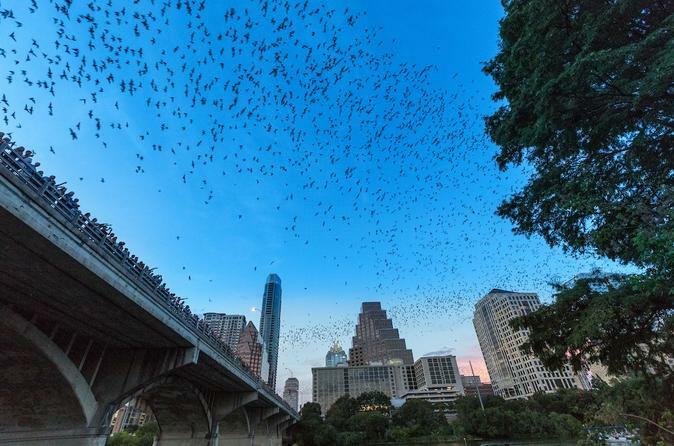 Experience the world’s largest urban bat colony emerge from under the Congress Avenue Bridge! This colony made up of 1.5 million Mexican free tailed bats is an amazing sight to see and hear. From the meeting point, join your professional guide at 6pm where afterward, you will paddle and observe one of nature’s wonders and learn about how these nocturnal creatures help create a better ecosystem for everyone. The tour is lasts 2 hours and food and drinks are not included. The Congress Ave Bat Bridge Kayak Tour is a great way to experience the water, nature, and a memorable bat moment. This is an experience you can only get in Austin. This tour is a total of 2 hours, beginning at 7pm and ending at approximately 9pm daily. Please arrive to departure point 30 minutes before scheduled departure. Customers will receive a full refund with 24 hour notice of cancellation. Customers will also receive a full refund in case of operator cancellation due to weather or other unforeseen circumstances. No-shows will be charged the full price.